Bourges Basket are the most successful club currently in the Ligue Féminine de Basketball with seven titles since its creation in 1999. The roster built for the 2012-2013 season is expected to defend the championship title won in May 2012 and challenge for a place in the EuroLeague Women Final 8. Veuillez trouver en bas du page des informations en français sur l'effectif de Bourges pour la saison 2012-2013. The women's section for the club Cercle Jean Macé Bourges Basket was created in 1987 and quickly rose up from the lower division. In 1990 they won the French Cup and by 1992 they had reached the top division. In 1993 Pierre Fosset became the president of the club and by the end of the 1994 season, he decided it was better for the women's team to be separated from Cercle Jean Macé Bourges Basket. In 1995 Bourges won the Ronchetti Cup as well as picking up their first French championship title. 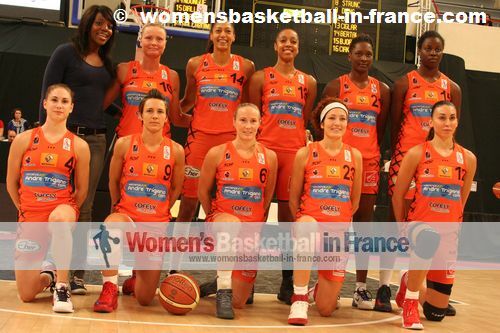 Bourges have not missed an edition of the EuroLeague Women since their first participation in 1996. While Fosset takes all the credit for the way the club is run, the success has also been down to the trainers (head coaches): Catherine Malfois (1988-1993), Vadim Kapranov (1993-1999), Olivier Hirsch (1999-2003) and Pierre Vincent (2003-2011). 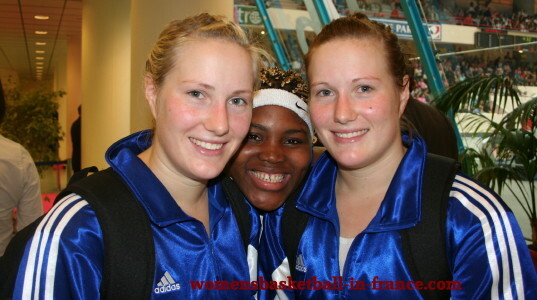 The Bourges Basket roster for 2012 was finalised shortly after the end of last season with the signing of: Zoi Dimitrakou (Charleville-Mézières), Pauline Krawczyk (Tarbes), Stephany Skrba (Lattes-Montpellier), Frida Eldebrink (ZVVZ USK Prague). Dimitrakou (left) has been signed as a medical replacement for Stella Kaltsidou who is not expected back until November 2012. At the time of writing this article Italian international Simona Ballardini has joined the club on a six-week medical replacement contract for Cathy Joens (stress fracture). Valérie Garnier continues her function of head coach and is assisted by Jérôme Authier. Une ancienne Berruyière et pensionnaire de la CFBB Pauline Krawczyk reviens après six années d'absence et renforce l'équipe, momentanément affaiblie par des blessures. La Suédoise Internationale Frida Eldebrink (dans l'image en-dessus à gauche), après deux années à la République Tchèque, retourne à nouveau jouer dans la LFB. Venant de Montpellier Stephany Skrba remplace l'intérieure Ieva Kublina. Zoi Dimitrakou et Simona Ballardini ont un contrat de pigistes pour Stella Kaltsidou et Cathy Joens respectivement. Margaux Galliou-Loko, une jeune joueuse évoluant du centre de formation de Bourges, a quitté le club pour joindre Cavigal Nice L2F. 20 September 2012: USO Mondeville 2012: Can they improve on last year's result?